Lemon and Ginger- These two ingredients bring sunshine and tropics. It’s sure to immediately lift your mood. Simply grate a teaspoon of ginger in a cup, squeeze in a large wedge of lemon and pour in the hot water. Steep at least 5 minutes before enjoying. The smell alone with bring you a jolt of happiness. One of Kat’s friends grew up in Trinidad, and she said they served ginger tea for every occasion. Just a sip can bring her back to the deep blue sea and bright sunshine. Kat often adds a dash of honey to the cup, to round out the flavors. Peppermint- I like steeping up some fresh peppermint if Kat can find it, but bagged mint tea will do nicely as well. The fresh herbal flavor will evoke images of lush herb gardens in the summertime. Just inhale that wonderful minty flavor and remember that spring isn’t too far away. Fruity blends- Choose blends with fruit flavors and aromas. Anything with berries, and/or fruit work nicely. In the winter Kat often reaches for Private Selection Acai, pomegranate, and blueberry green tea. Her mother enjoys sending her tea care packages from time to time, and this tea from Kroger came in her last shipment. As soon as the hot water hit this tea, the aroma uplifts her mood. The sweet, fruity pomegranate and blueberry flavor bring an inner sunshine to the day. The flavor is strong and juicy, so Kat doesn’t normally take any sweetener, but a touch of honey would also be lovely. This would be a fantastic refreshing iced tea as well! The flavor evokes picnics in a sunny meadow where wild berries grow. These are just a few ideas to melt away those winter blues. Do you have any of your own winter go-to teas? I’d love to give Kat even more ideas! Kat loves her tea. She’s also on a budget. So as much as she enjoys ordering the occasional loose leaf tea from a boutique tea retailer, when it comes to her every day tea, she picks up her supply from the grocery store. If you haven’t looked at the variety of teas available lately, you’ll be amazed and delighted at the selection. First, there are the cherished brands that many people know and love, like Bigelow, Celestial Seasons, Republic of Tea, and even Lipton. But then there are the store brands that have made quite an impression on both Kat and me. The more we try, the more we love them. And her pocketbook loves them as well! When she runs to a Kroger store, the Private Selection Teas are a favorite. The Acai, Pomegranate and Blueberry Green Tea is a staple in our home. 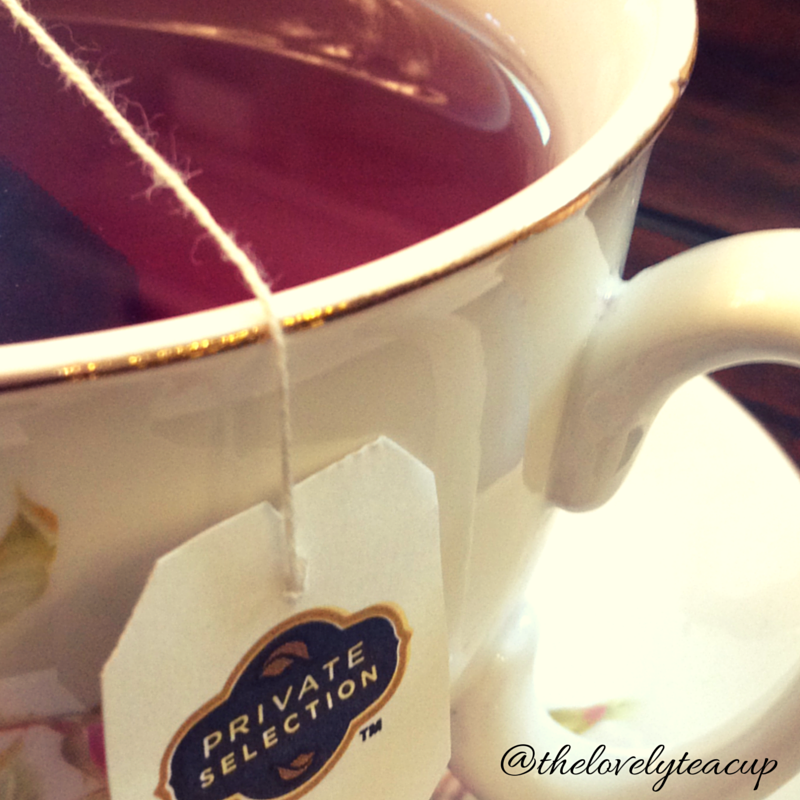 While many fruit blend teas can be overly sweet, this is a subtle, beautiful blend that is absolutely heavenly! A trip to Target always results in a stocking up of Simply Balanced Organic Black Tea Breakfast Blend and Organic White Tea Peach Honey. Kat can’t seem to ever get enough of these. Hot or iced, they are a crowd pleaser. What she loves about so many of these store branded teas is that they are affordable, easily accessible, and they taste so good! No matter where she is, she can find good tea very easily. The best part? Each tea bag comes in its own airtight envelope that she can slip in her purse or my carrying case. No muss. No fuss. Char felt this way, and I know Kat does, too: Tea is one of the greatest luxuries, and its universal appeal is that it’s so accessible. and that is as it should be! The teas available on our grocery store shelves are a lovely, affordable luxury. My question to you? What grocery store tea is your favorite?